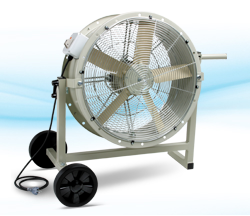 View our range of commercial floor fans suitable for many commercial applications such as warehouses, factories, gyms and other commercial and industrial zones. This range of floor fan products are made for continuous use and have exceptional air movement required of large commercial spaces. They project the air movement upwards and out, many with tilt functionality. They are portable enough to be able to move them between rooms, and storage if necessary while providing powerful air delivery.